A man sustained a laceration to his head which required five stitches after a bottle was thrown at him in a local nightclub, a court has heard. Andrew Hetherington threw the bottle at the victim after he was bumped into on the dance floor of the club. Hetherington, of the Ardnabrocky estate in Drumahoe, pleaded guilty to wounding on April 11, last year. 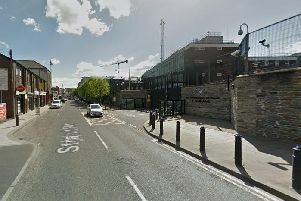 Londonderry Crown Court heard that there was a ‘fracas’ inside the night club on Shipquay Street after the 20-year-old and his girlfriend had been bumped into on the dance floor. Hetherington reached out, grabbed a bottle and threw it at the injured party. The bottle struck the man on the top of the head and he sustained a laceration which required five stitches. Door staff at the night club gave first aid to the man and detained Hetherington until police arrived. During police interview, Hetherington admitted he had thrown the bottle. He also told the police he did not intend to cause any injury to the man. It was revealed Hetherington had no previous convictions. Defence counsel Mark Reel said his client had acted ‘impulsively’ and ‘lashed out’ on the night. He told Londonderry Crown Court that there was ‘some degree of provocation’ but nothing that justified the 20-year-old’s behaviour. Mr Reel said Hetherington had suffered with anger management issues and mental health problems in the past. However, he said this incident has had a ‘sobering effect’ on the defendant and he had reduced his alcohol consumption as a result. The barrister said the defendant was ‘a fundamentally decent, hard working young man’. Passing sentence, Judge Gemma Loughran said the incident was a ‘serious matter’ as a ‘young man who went out for the night to enjoy himself ended up with a wound which required five stitches’. She advised Hetherington that he should ‘never engage in excessive use of alcohol given your temper and impulsivity’. The judge suspended an eight month sentence for three years and ordered Hetherington to pay £3,000 compensation to the injured party. She told Londonderry Crown Court that the punitive fine would help remind Hetherington of that such behaviour has consequences. The District Judge told the 20-year-old: ‘You won’t have much money to drink, not much money to socialise or go on holidays for the next while. “I sincerely hope your family don’t help you out to pay this as you should suffer financially.